It’s been more than three months since the last time I updated the blog. I feel terrible not to update this periodically. I love writing from my childhood and I keep writing journals even though I have some long period that I had not written in the past. Well, I usually write in my native language which is Japanese. So it is challenging for me to write a blog in English. I appreciate that people read this blog looks like three grader’s composition. However, I believe that there are people out there who are curious about my studio and my work. Improving English skill is one of many things that I would like to do. I know I can use this opportunity to practice it so I decide to write once in two weeks now on no matter what. It’s never too late to have New Year resolution, right? I will write this blog as our studio record/ my weaving project record. One month has passed in 2015 and I have already been blessed in so many ways despite a big life change. My older son Asa enjoys his college life in Hampshire, Amherst, MA. Now my younger son Nori flew to Japan on Jan. 6th planning to stay there for a half year. He enrolled to Tokyo Shure, an alternative school in Tokyo where I used to work before the marriage. I was lucky that I didn’t have to worry about Empty Nest Syndrome because I had a big show opening on Jan. 15th “Harmony/?” at Worcester Center for Crafts. There are 6 tapestries and 6 wearable items in the show along with Sumiyo’s painting and ceramics and Tomo’s glass work. Thanks to many supporters, the opening reception went wonderfully. It was a huge turn out. Sumiyo, Tomo and I were overwhelmed by it. The show runs through Feb. 28th. If you have not seen it, please come to visit. I really appreciate your sincere feedback. In 2015 I started a new program called “the Study Group” for people who have a loom at home and want to work on same assignments together. This is my long year dream. It is a 6 months program for one cycle. In this way we all can study and experiences of 6 assignments (1 assignment for a month) together. Some members have been our studio members for more than 6 years, some have been more than 4 years and some are relatively new. It doesn’t matter. The first assignment was weaving with one color. Oh, what a interesting fact that no one had similar interpretation. Everyone had a story for the work or two. We will show our results at our studio exhibition in July. The most important part of this group is having each other who support everyone’s own journey and learning process. At last, I finally put the curtains at windows of the studio. My previous intern Alana helped weaving materials two years ago and Annie recently sewn strips. Now the studio looks more cozy. Outside of the window is a huge snow storm now…Stay warm and safe. I would be very interested in hearing more about the Study Group and the assignments. 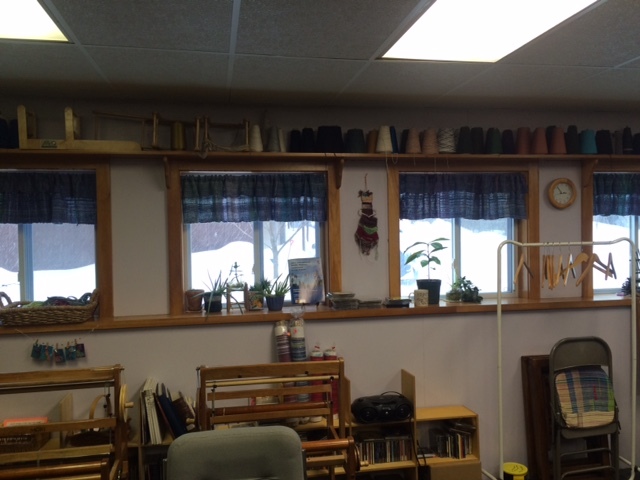 I have had a Saori loom for several years and would welcome the community and inspiration. If it’s possible, please join us for the next cycle. I would urge anyone who has not seen the show at the Worcester Center for Crafts to get there before “Harmony” closes at the end of February. It is beautiful!